In putting together this piece, which is about Joseph Needham and (I trust to a lesser extent) me, I have held in the background the Fourth Note of the Oratory (Labour of the Mind), especially “Its birth in a University and the learned tradition in religious communities give the Oratory a duty of thought and study”. 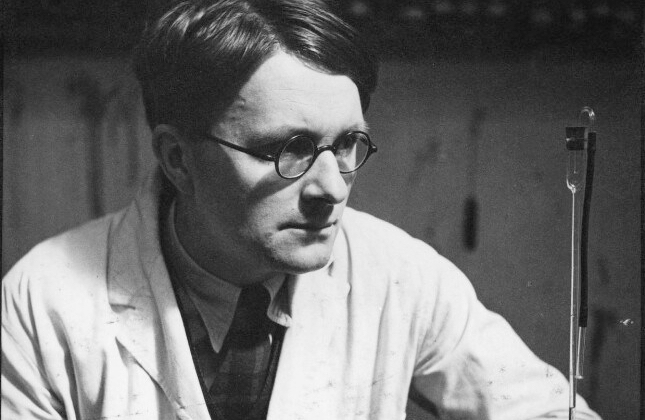 Joseph Needham (1900-1995) may not be a household name. He deserves to be. Scientist, historian, linguist, sinologist, Master of Gonville and Caius College, Cambridge, Fellow of the Royal Society, Fellow of the British Academy, Companion of Honour- Renaissance man great and good indeed, and, and this is the big and, there was an involvement with the Oratory of the Good Shepherd. My own first awareness of the existence of Joseph Needham was seeing shelves of bookshops and libraries, and brethren will know my delight in bookshelves, containing the vast bulk of his “Science and Civilisation in China” followed by the respective numerals, published by Cambridge University Press. An abridgement “The Shorter Science and Civilisation in China” was published from the 1970s and I bought Volume 1 about 1990, about the time I first joined the Oratory and went to work in mainland Europe. Volume 1 was, as you would expect, an introductory volume and it attracted me by introducing me to a civilisation about which I knew little through the things I enjoy reading about: language, history and religion. In the next few years four subsequent volumes appeared, and every year when I came over to England for, among other things, OGS retreat and chapter I bought one more volume and used it within my rule of reading. Those next volumes of “The Shorter Science and Civilisation in China” were rather more demanding, covering Chinese mathematics, astronomy, geology, physics, mechanics, nautical technology… all sorts of things which my education had allowed me to ignore, and I somehow hoped, in the spirit of labour of the mind, that something would rub off. Five volumes of Needham sit on my shelves (I think they are now out of print), but it is a measure of Needham’s industry to recall that these five volumes are just an abridgement. I don’t know when I first heard that Joseph Needham was a practising member of the Church of England of a definite catholic persuasion and that he had had contact in the 1920s with the Cambridge Oratory House. Back to that later. A biography of Joseph Needham was published in 2008 by Simon Winchester entitled “The man who loved China”. The publisher’s blurb amplifies this by calling it “The fantastic story of the eccentric scientist who unlocked the mysteries of the Middle Kingdom” which is over-egging a bit, but Simon Winchester’s biography is the source of the information I am going to give you. Joseph Needham was born into a middle-class professional family in London in 1900. Like Professor Richard Dawkins, he was introduced to the study of biology at school at Oundle. After his first Cambridge degrees, he was elected to a fellowship of Gonville and Caius, specialising in embryology and morphogenesis. Needham married Dorothy Moyle, a biochemist, in 1924 and the marriage lasted until her death in 1987. However, in 1937 he met Lu Gwei-djen, a Chinese scientist from a Christian family, who came to Cambridge for post-graduate study, and she and he began a relationship which was accepted by Needham’s wife, after whose death Needham and Lu were married in Caius Chapel in 1989. In 1939 Needham had produced a work on morphogenesis that a Harvard reviewer claimed “will go down in the history of science as Joseph Needham’s magnum opus”, little knowing what would come later. Needham continued to teach biochemistry until 1966, having been appointed Master of Caius in 1965. He died in 1995. Joseph Needham’s involvement with China dated from his involvement with Lu Gwei-djen in the late 1930s and she encouraged him to learn Chinese. He was in China from 1942 to 1946 at the Sino-British Science Co-Operation Office in Chongqing, and made return visits to the People’s Republic of China in the early 1950s, 1964 and 1972, when he met communist leaders up to and including Mao Zedong and Zhou Enlai. An anecdote about this period the time, which only has the authority of Needham himself, relates how he was summoned into the presence of Chairman Mao no less, who sought Needham’s advice, as one known to drive fast cars with enthusiasm, as to whether the Chinese people should be allowed bicycles or motor-cars. Needham favoured bikes, thus, his biographer suggests, sparing China a generation of pollution, although back in Cambridge Needham inclined to the fast car. I get the impression that Simon Winchester is slightly out of his depth on the subject of Needham’s religion. He records how as a boy Joseph Needham was taken to the Temple Church and sat under the future Bishop Barnes of Birmingham, lapsed at Oundle and returned to Christian practice at Cambridge, including prayer for success in examinations. The next passage from the biography I am going to read verbatim, since I reckon there are a number of lines to be read between (page 23 of Simon Winchester): “..Needham had yet to direct the spiritual side of his life. For two years of apparent flamboyance he seriously considered becoming immersed in a fully organized religion. He went so far as to enrol as a practicing lay brother in an Anglo-Catholic monastic organization, the Oratory of the Good Shepherd; and for a while he tried to follow the disciplined routines of the Oratory House. But there was a problem: among the many strictures Needham was obliged to obey was celibacy- a vow that proved far too much for him. And so in 1923, after two full years, he left and returned to worship the deity on his own terms”. (No authority is cited for these statements.) According to Simon Winchester, after 1925 Needham and his wife found what they were looking for in the village of Thaxted, twenty miles from Cambridge, where the catholic socialist Fr Conrad Noel was vicar. The Needhams remained “supporters” of Thaxted well on into their old age. Winchester cites Needham’s support of a later vicar Fr Peter Elers who came out as gay in 1976, a eulogy at the funeral of the left-wing Anglo-Catholic Tom Driberg, and what he calls his last sermon in the college chapel on Trinity 4 1987, his theme being “Greed and Capitalism”. There are two interesting instances of what we call in the Oratory “a concern for living interests and problems in Church and State” and “to bring new thought and knowledge under the discipline of Christ”. There are no published works in which Needham probed the relationship between Christianity and his scientific and Chinese insights. In a collection of writings printed in 1990 he described himself as an honorary Taoist, and among the religions of China favoured the religion of the Tao and Confucius over Buddhism. Needham could of course plead shortness of time for failing to produce any systematic reflection. In the “Shorter Civilisation” I have looked in vain for any reflections, but perhaps I have looked in the wrong places. The other instance concerns Needham’s closeness, alluded to earlier, to the leaders of Communist China. It is to be remembered that China in the years 1942-46 when he was in Chongqing was a poverty-stricken failed state, from which Mao’s assumption of power in 1949 was seen as a liberation. In the Korean War 1950-53, in which the new China and North Korea were pitted against largely US-led forces, Needham allowed his name to be used to make accusations of germ warfare even though, his biographer suggests, he was not fully convinced by the evidence. Perhaps more seriously, Needham offered little public criticism as the excesses of Mao’s totalitarianism became widespread knowledge, not even during the Cultural Revolution 1966-1976 when some of his former academic colleagues were targeted. To end on a personal note, I have returned to reading Joseph Needham this year since as brothers know I have been continuing an Open University course in Chinese, as my labour of the mind. Obviously I am aware, depressingly aware, of how puny in comparison my efforts and achievements are in my discovery of China. And yet I can sympathise with the joy he felt after 1937 at meeting a history, language and religions which start from completely different bases from what I have met before. Finally there is what is what is actually known as the Needham Question: why had modern science only originated in the western world? This past fellow-traveller of OGS has given me a lot to think about.